Assembled by a team of authors, academics and journalists, this selection sets out to celebrate the depth and diversity of Scottish literary culture, taking in the obvious and obscure from across four centuries. From the opening paragraph of Buddha Da, there is a lyrical beauty about this book. It reminds me of my favourite songs, the ones that take me somewhere special whenever I hear them. So it is with Anne Donovan’s novel. The story of Jimmy, the Glaswegian painter whose decision to become a Buddhist irrevocably changes his family, is told in my own tongue; and the language of Glesga, so often considered rough and uncompromising, has never been made to sound so poetic and smooth. Jimmy’s search for spiritual answers could be seen as a mid-life crisis. It affects his apparently happy marriage, with his daughter a sometimes bemused, sometimes astute observer. Anne Donovan tells the story in three distinct voices: those of Jimmy, his wife Liz and their 12-year-old daughter Anne-Marie. It’s a difficult task which is accomplished with apparent ease. It also allows a different experience of the novel whenever it’s approached. 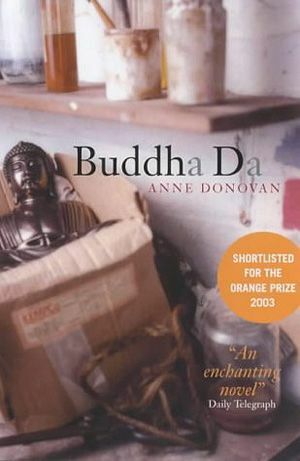 The first time I read Buddha Da, I found Anne-Marie’s voice easiest to engage with, Liz’s the hardest to relate to and Jimmy’s the one that annoyed me the most. ‘Pull yourself together, man,’ I shouted at the pages. Maybe I empathised more with his wife than I cared to admit? When I read it a second time, it was with a surprising degree of sympathy for Jimmy. Maybe it’s just that I’m getting older and should warn my nearest and dearest of impending erratic behaviour, or a sudden quest for some sort of spiritual contentment. Jimmy’s conversion to Buddhism could be a break with the religion of his past, or a way of living for the future. Or maybe it’s all just a gamble; Jimmy as the Glasgow Dice Man, throwing a one to become one with oneself. Religion and spirituality is important in the novel, just as it is a part of Glasgow’s character. If anyone asked me to name a Catholic Scottish novel, I would cite Buddha Da. It’s not only because of the background of the McKenna family, whose cradle Catholicism wafts out of every page like Benediction incense despite Jimmy’s pursuance of Buddhism, or the trinity of voices that tell the story. It is also in the imminent birth of a baby, as the novel draws to a close, which offers hope for a better future and a possible redemption of Jimmy and Liz’s relationship. I said the book reminded me of my favourite songs and if Buddha Da was a record it would be the Smiths’ self-titled debut album. I can’t say better than that. Further reading: Hieroglyphics (2001) features an array of female voices from innocence to experience in a warmly observed, moving collection of stories. View the complete list of the 100 Best Scottish Books.